New York City gets its share of out-of-town visitors on Saturday nights, but Manhattanites got a bit of a shock this past weekend when a coyote paid a visit to a basketball court in Riverside Park. While it may be a surprise for city-dwelling humans to come face to face with a coyote, it's not that unusual for wildlife to appear in urban areas. 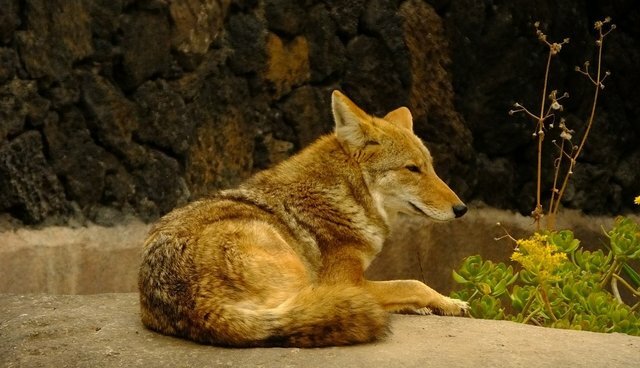 Sarah Aucoin, head of the NYC Parks Department's Urban Rangers program, told The Dodo that coyotes are common in New York State and established in the Bronx. It's natural for coyote pups to disperse from their family groups at this time of year, and the young female who was found may have come to Manhattan from the Bronx or elsewhere using the train line as a corridor (coyotes - they're just like us!). "There are coyotes in New York City every day," Aucoin said. "They just don't attract as much attention if they're not running around Manhattan!" She noted that the increased presence of wildlife in Manhattan should be viewed as a positive trend, as more wildlife means more healthy habitats. "If the habitat is there, it means the food is there, which is a great sign," she said. Other wildlife making a comeback in the New York City area include flying squirrels and river otters in Staten Island, red-tailed hawks and peregrine falcons, owls and even harbor seals. Aucoin mentioned a recent sighting of a seal hauled out on a rock near the Mayor's East Side residence, Gracie Mansion. "It's uncommon to see that anywhere, so it's especially great to see it here in New York City," she said. As for our coyote friend? Aucoin says the coyote was released in a safe area, but she declined to give a specific location out of concern for the coyote's safety. She was given a clean bill of health, and Aucoin said that the last she saw of her, she was running off "just as we would hope a coyote would." – Observe from a distance. – Never feed wildlife (including inadvertently by littering or leaving food scraps behind), as negative interactions occur when animals associate humans with food. – Always walk your dog on a leash. – Report strange behavior - seeing a wild animal in the city is not necessarily strange, but an animal approaching a human without fear, or worse, with aggression, is a bad sign.